A no-nonsense Earthling corporal, Nike accepts a mission to destroy the winged-people of Cupidis to give her species a new home planet. A spoiled Cupidian prince, Edonys gets whatever he wants until his dying father tells him he must choose a mate and take his rightful place as king. Nike and her reconnaissance crew's space cruiser lands upon Cupidis, and they are taken to the royal palace. The king's decline leads her to believe Mission: Conquest will be easy. Edonys refuses his father's last request to fall in love, but Nike isn't anyone. She's bold and different than any Cupidian female. As Nike and Edonys's quests intertwine, an Earthling and a Cupidian will find it easier to ignore the pull of gravity than the pull of love. 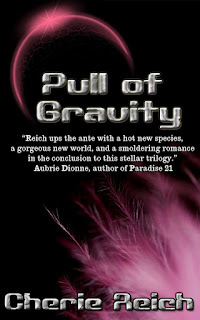 From the Author: Although this is book three of the Gravity trilogy, Pull of Gravity is a stand-alone novella. I wrote book one, Defying Gravity, back in December 2009, and I never thought I would have more than one story from it, but I’m pleased how the ideas came to me over time for Fighting Gravity (by far the hardest one to write) and Pull of Gravity. This one was the most fun of the trilogy to write, especially since I got to imagine these hot angel-like aliens and a beautiful planet. Also, this trilogy is a mixture of genres: fantasy, science fiction, and romance. Behind the Scenes: When I published Defying Gravity, I had planned to write and publish Fighting Gravity and Pull of Gravity, but I almost didn’t continue with the series. Yet I pushed through and am glad I did. Pull of Gravity in a lot of ways was easier to write, since I had these clear characters and their story in my head, but some things still surprised me, particularly concerning Edonys’s mother. Author Bio: Cherie Reich is a writer, freelance editor, book blogger, and library assistant. She enjoys writing horror, fantasy, and mysteries, but she doesn't let that stop her from trying other genres. Her short stories have appeared in magazines and anthologies, and her e-books include the horror novelette Once Upon a December Nightmare, the fantasy series The Foxwick Chronicles, and the space fantasy trilogy Gravity. She is a member of the Virginia Writers Club and Valley Writers and placed third in Roanoke Valley's BIG READ writing contest. The entire Gravity series is fantastic! I have these in my TBR. Can't wait to get at them. Thanks Mary and Christine! And thank you for having me!